This site is dedicated to the memory of my father, Casimir Leon Rygiel (1925-1999), who, with my mom, in the most beautiful marriage that I have ever seen, has been the example in my life for love, compassion, giving and caring, passion, drive, and the pursuit of excellence in every facet of life. Thank you, Dad! 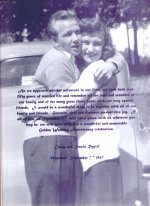 The picture below is of my Mom and Dad on their Honeymoon in September, 1947. The wording that is on the front of the picture is something that they put together to give to friends and family in celebration of their 50th Wedding Anniversary held on September 7, 1997 on Mackinac Island, Michigan. Click on the photo to see a large (readable) version.